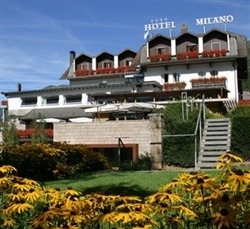 Milano Alpen Resort Meeting & Spa Hotel Bergamo Bergamo, Hotel Italy. Limited Time Offer! More of aRead more Luxury establishment, this four star hotel is located in Bergamo. Several amenities, notably Restaurant, Room Service, Bar, Business Center are available at the hotel.It is situated at Via Silvio Pellico, 3, 24020 Castione della Presolana BG, Italy in the north-east section of Bergamo, at only 78 minutes by car distance from the center.The Orio Al Serio airport is about 78 minutes by car from the hotel (24 miles ).This hotel offers a unique service : conference facilities.High speed internet is available in this hotel.Relax yourself in the hotel's sauna. Eurohotel is based on the beautiful valley beneath the Presolana Mountain, just 200 meters from the Alpen Spa welness centre. Eurohotel is a 40 minutes' drive from Bergamo and Orio Al Serio Airport.